Post Tagged with: "star wars rebels"
Beatriz Mourad, Andy Potter, and Jeff Andersen discuss the series finale of Star Wars Rebels. Dylan Hysen reviews and recaps the mid-season finale of Star Wars Rebels, “Legacy”. Dylan Hysen reviews and recaps the latest episode of Star Wars Rebels, “The Future of the Force”. 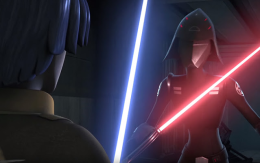 Dylan Hysen reviews and recaps the latest episode of Star Wars Rebels, “Stealth Strike”. Dylan Hysen reviews and recaps the latest episode of Star Wars Rebels, “Blood Sisters”. 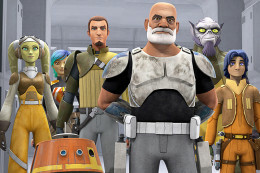 Dylan Hysen reviews and recaps the latest episode of Star Wars Rebels, “Wings of the Master”. Dylan Hysen reviews and recaps the latest episode of Star Wars Rebels, “Brothers of the Broken Horn”. Dylan Hysen reviews and recaps the latest episode of Star Wars Rebels, “Always Two There Are”. Dylan Hysen recaps and reviews the latest episode of Star Wars Rebels, “Relics of the Old Republic”.